I’m still trying to find a cleaning routine that works for me. But one project that I thought might help make some new cleaning routines stick is storing cleaning supplies right next to the job at hand. In the past nine years, we’ve had babies and small children to worry about, so I’ve been careful to store cleaning supplies high up on a shelf. 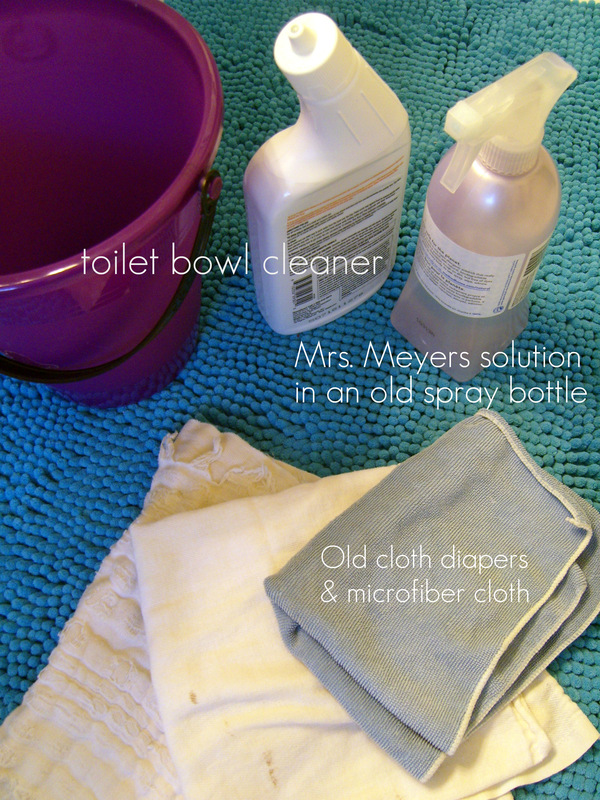 I do have a bin upstairs and another downstairs, but now that the kids are old enough not to drink the toilet bowl cleaner, if I store the essentials within reach in each bathroom, they can also help with the cleaning. After a week, I think it’s working. I bought an extra spray bottle and stocked up again on Mrs. Meyer’s Clean Day (the lemon verbena scent is our favorite). 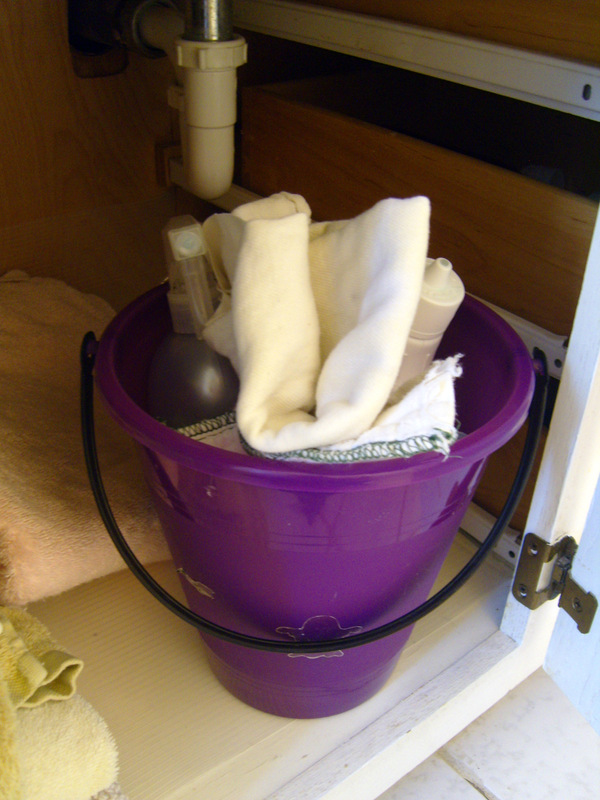 Each bathroom now has a bin or bucket with a spray bottle of cleaner, a bottle of toilet cleaner, and several clean rags. The older kids have been instructed on how to clean the sinks, mirrors and toilets, and Miss Six has already earned some cash. Little Four likes to wipe down the sink in the powder room, usually after a prolonged splashing session. (Mr. Nine has been studiously avoiding this chore, preferring to be the Garbage-Can-and-Recycling-Bin-Bringer-Inner.) I’ve been wiping down the master bath most every day after my shower, since it only takes a minute and the supplies are RIGHT THERE. I have a vac in the basement and one on the first floor. I couldn’t justify buying another for upstairs so I bought a Swiffer to keep in the bathroom closet. It doesn’t get the floor as clean as I would ideally hope, but it sure is better than it was. If I just got another hand vac, I think I’d be in business. Just the right size for getting all the dust and stray hair on the bathroom floors. Our baths are pretty small. This is a great idea. I need to do something similar for they boys! One of MY biggest obstacles to getting the kids to help with chores is that they need help gathering supplies. My goal is to get to the point where I just have to ask nicely, and someone else will do some of these things without my involvement! i love this idea so much. it just makes such good sense. I’ve seen tips in magazines and on other blogs to keep Clorox wipes handy in every bathroom, but I try not to use so many disposable cleaning supplies. I like that the Mrs Meyer’s cleans everything, too (I could probably skip the toilet bowl cleaner)-even the mirrors are streak-free, esp. with a microfiber cloth! Ways for the kids to contribute to the keeping of the home, and making it convenient to boot. Smart. Very smart. We’ve only got one bathroom, but it could use a bucket of cleaning items, instead of a bucket of painting items and cans of paint. I’ve been finding Ms Meyer’s too strong smelling. Switched back to making it myself (but it is annoying to make it fresh each time), there’s probably a better way to make my own. This is a good reminder. Good luck with the cleaning! I’ve been diluting the all-purpose cleaner, maybe 1/4 cup of cleaner and fill the rest with water. Seems to be strong enough to clean without leaving an overpowering scent. But four years after having my last baby, I’m finally okay with scented products again! For the longest time, they all smelled too strong! I still don’t like overly floral scents. We sometimes have that problem, too–we still have cleaners in our garage and basement left from the previous owners of our house! We used up some things, but I should take a good look at what’s left and maybe freecycle it. I like the Mrs. Meyer’s because it’s good for nearly everything: bath fixtures, wood floors, cabinets, walls–I even dust with it.